Apple recently filed a patent application containing drawings of a Smart Keyboard with "Share" and "Emoji" keys, and a key that can be used to both search and invoke Siri, suggesting it may be exploring a new version of the iPad Pro accessory to be sold alongside next-generation models. The drawings show that pressing the "Share" key would bring up a share sheet on the iPad Pro with options to share through apps such as Facebook, Mail, and Messages. There is no description of how the "Emoji" key would function, but pressing it would presumably bring up the on-screen Emoji keyboard on the iPad Pro. 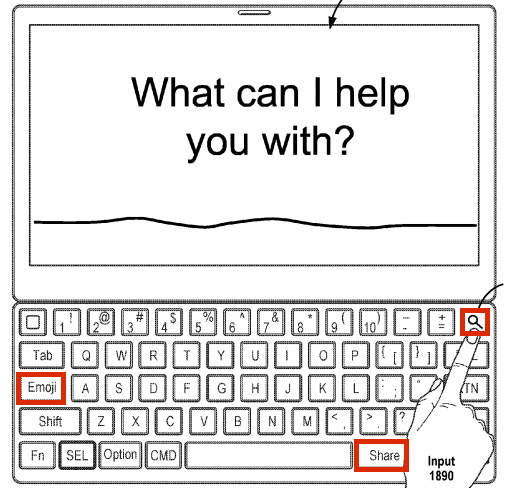 The current Smart Keyboard already has a globe key in the bottom left corner that can bring up the on-screen Emoji keyboard, but this key is not visualized in the patent drawings. There is a non-existent "Fn" key in its place. The third key, labeled with a magnifying glass, would serve multiple purposes. A single press, for example, could bring up a search field for searching within apps. A double press could bring up shortcuts for Messages, Photos, Calendar, Camera, Notes, Settings, and other apps. Long-pressing the key would invoke Siri. Since this is not a design patent, Apple's drawings are not entirely accurate, but rather just basic visualizations. The "Share" key is located where the right-side Command and Option keys would normally be, for example, while the "Emoji" key is included in lieu of Caps Lock, which is an essential key. Nevertheless, we roughed up a quick mockup of what the new Smart Keyboard could look like based on the same layout of the new keys as Apple's drawings. Apple is rumored to launch a trio of new iPads as early as March, but possibly not until later this year, including an all-new 10-inch range iPad Pro with an edge-to-edge display. The other models are expected to be updated 9.7-inch and 12.9-inch iPad Pro models with faster A10X processors. 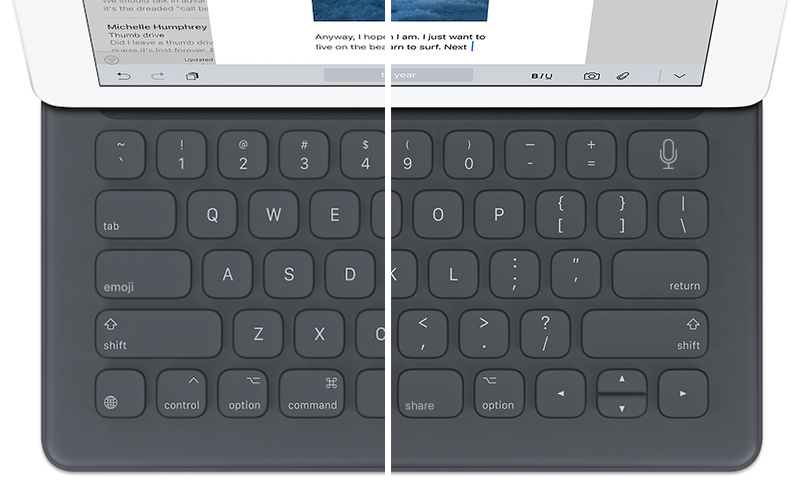 A so-called "Smart Keyboard 2" could accompany the new iPads and perhaps the so-called "Apple Pencil 2" rumored to launch this year. The current Smart Keyboard was released in November 2015 and costs $149 and $169 for the 9.7-inch iPad Pro and 12.9-inch iPad Pro respectively. International versions such as British English, Dutch, Korean, Spanish, Italian, German, Swedish, French, and Arabic were released in August 2016. Nice Keyboard, thanks for sharing.